The following is a Press Release from Faxon Firearms. (Cincinnati, OH) – Faxon Firearms, manufacturers of the ARAK platform rifle system, is pleased to announce the release and shipment to dealers of its STREAMLINE series of handguards. True to their namesake, the new Streamline handguards are a sleek and low-profile solution for those looking for a slimmer handguard with flexible mounting. Further, the Streamline features an uninterrupted MIL-STD 1913 “Picatinny” rail across the top and 7 facets of M-LOK cuts at the 90 and 45-degree facets. Rail slots are directly engraved with “T” marks during machining to identify accessory placement anodized or if customers opt for custom coatings. 45-degree facets. Rail slots are directly engraved with “T” marks during machining to identify accessory placement anodized or if customers opt for custom coatings. The handguards are released in four lengths, 15”, 13”, 9”, and 7”. 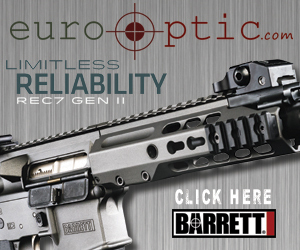 The handguard is 100% made in the USA from extruded 6061 aluminum. The handguards are hard-coat anodized black and feature a steel barrel nut. Mounting is extremely simple with common tools and the handguard features alignment tabs to ensure it cannot rotate during extreme use. About Faxon Firearms: Faxon Firearms is a leader in constant evolution in the firearms and MSR marketplace. Faxon focuses on US-made quality and innovation. From the ARAK platform, GUNNER & FLAME barrels, MuzzLok (crush-washer free) muzzle devices, and now the Streamline series, Faxon offers quality complete rifle systems and components. New dealers are welcome. Seekins Precision is proud to announce the release of their new Patent Pending NOXs handguard system. Pronounced “knocks”, it is designed as a lightweight, slim profile handguard. The CNC machined NOXs handguard weighs in at only 10oz and offers features such as integrated sling mounts, continuous skeletized top rail design, anti-rotation tabs and a Patent Pending weapon mounting system. The NOXs provides the shooter with a lightweight, adaptable platform that eases individual configuration and weapon manipulation. The NOXs handguard will be available in 9”, 12” and 15” lengths with models available using either the Keymod or M-Lok mounting systems. Seekins Precision is releasing the NOXs handguards with an MSRP of $159-$179 depending on the selected length. For more information on the NOXs handguard and the rest of the Seekins Precision family of products, be sure to check out our website at www.seekinsprecision.com or contact us at sales@seekinsprecision.com.